There are plenty of words that come to mind when people bring up Nerf guns: fun, powerful, fast––but is safe one of them? If it’s not one that comes to mind for you, it bears some thinking about, especially if you have children that you’re planning to equip with Nerf arsenal. We’ve taken a look at a variety of resources in order to answer the question of Nerf safety, so keep reading! If you Google Nerf injuries, the most common results you’ll see, by far, are eye-related. And it’s no surprise; our childhood memories are full of our parents warning us to be careful because we could, “put an eye out!” whenever toys (and other things) started to fly. Back in February, the Daily Mail reported on a young girl who had been struck in the eye by her brother’s Nerf gun and ended up going to the hospital as a result. Thankfully, she received no lasting damage, but it was a wakeup call for many parents. It goes without saying that this tragedy would have been prevented had the little boy and his sister been using protective eyewear while playing with their Nerf weapons; in fact, that’s something that Hasbro––the makers of Nerf––strongly recommend and even market. Frankly, everyone who is using Nerf guns––young and old alike––should be putting on protective eyewear before they play. It falls into the same category as buckling up in the car or putting on a helmet when biking. Are Nerf Guns too Powerful? 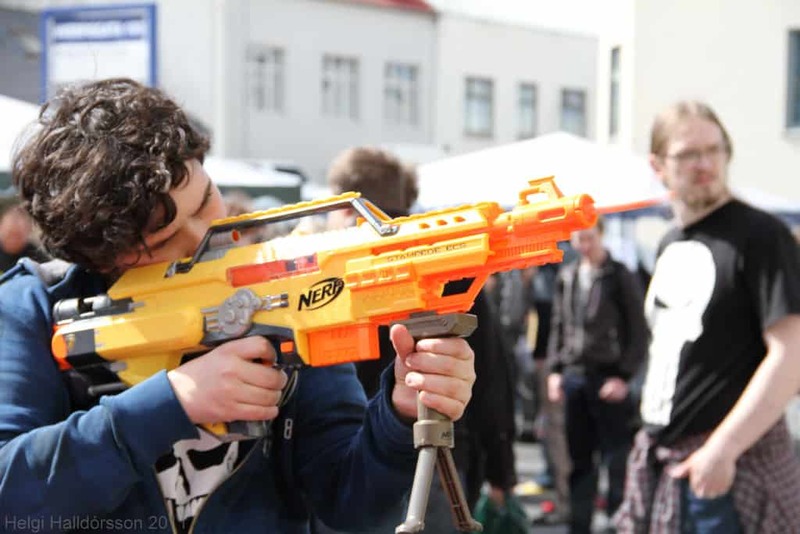 Generally, unless a Nerf gun has been modified to be more powerful than it would normally be, it shouldn’t be powerful enough to leave welts on skin as long as it’s being used correctly. The main injuries that come from Nerf guns are eye-related, and as we’ve mentioned, that can be avoided easily with the use of protective eyewear. That said, as the folks over at Gizmodo pointed out, Australia has recently decided to ban certain Nerf guns. The Nerf Rival series certainly could fall into the “too powerful” category, as they are capable of launching darts at speeds up to 70 MPH. This is too fast for most parents to be comfortable letting small children use, although for older Nerf users who are capable of playing responsibly, it shouldn’t be too much trouble. While we can’t completely disagree with Australia’s decision, it’s worth thinking about an age restriction or warning instead, similar to what goes on other children’s toys, video games, and movies and TV. As long as protection is worn, Nerf guns seem to pose very little danger in and of themselves. Rather, it’s what people are doing with them that is causing injury and sometimes even loss of life. As reported by the Star Tribune in April 2017, kids and young adults engaging in a pastime known as “Nerf Wars” have been taking the ordinarily fun activity to dangerous levels. It’s sad to think that someone could lose their life over foam darts, but what this story underscores is the need for forethought, boundaries, and––most importantly––supervision. There is no reason that teenagers should be allowed to drive around shooting toy blasters at one another out of car windows. Again, and it cannot be stressed enough, these kids weren’t in danger from Nerf guns. They were in danger from their own reckless behavior. 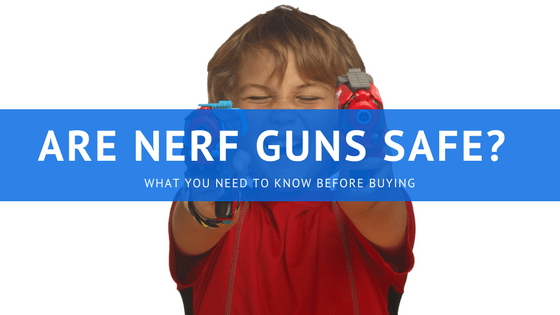 There are inherent dangers when using Nerf guns, whether that be from darts flying into eyes or blasters that are too powerful, but these can be mitigated, if not avoided outright, by the use of protective gear and a little common sense. It’s the second point that is the more important of the two. Kids shouldn’t be allowed to shoot things at each other without protective eyewear, and they certainly shouldn’t be allowed to use any type of toy while operating something as dangerous as a car. This isn’t rocket science, but kids can’t always be counted on to keep a level head while they’re having fun. That’s why it’s ultimately up to the parents to make sure that everyone keeps having fun. At the end of the day the best way to keep kids safe while they enjoy Nerf guns is a simple one: supervision.